Note: Oops. I forgot. We didn’t skip straight from Saturday to the rainy, wildlife-based Tuesday. My bad. On Sunday, we woke up less hung over than we deserved. I mean, we’re responsible adults with acceptable alcohol tolerances and no one was driving, but we did, eventually, feel the effects of…well. A good bit of beer and wine on systems turned upside down. Literally. I’ve never been to Hawai’i, but I saw no other option. We were in freaking Australia — no amount of rain was going to keep us in the hotel for long. Graham was so impressed by just how not-dead he was feeling that he suggested we get out and do something, maybe one of the siteseeing things that’s open seven days a week. We hadn’t really planned to do anything on Sunday except bum around the neighborhood, get our bearings, maybe check out the pool… But we were fine! We had energy! All we needed was coffee! It’d be fun! Breakfast was an experience. The scoop on our hotel, the Vibe Sydney (downtown), was that we could skip the cafe because there were so many lovely places to eat within walking distance. This wasn’t so true on Sunday, though, or we walked in the wrong direction. We wound up at the Hyde Park Cafe, where my breakfast sandwich was nummy and Graham’s naked waffle was less nummy. A word about the coffee: We knew, about five hours before we arrived, that the coffee-ordering process would be a mystery. Thanks to Bill Bryson’s In a Sunburned Country (thanks, Jeff! ), we knew there would be vocab to learn (and Bryson doesn’t help, aside from telling readers what he orders). I still couldn’t pass an Australian coffee vocab test, but suffice it to say that “coffee” means “espresso” and all the other words tell the server what to do with that espresso. The first server we had was an angsty young man who did not live up to Australia’s shining tourist-friendly reputation, but the Curve lounge in our hotel had a cheat sheet. After breakfast, we decided to explore Hyde Park and were promptly buzzed by an ibis with no respect for personal space. I feaked out–I had a list in my head of what kind of bird it could be (we learned the next day what it was), but it acted like a very tall, very pompous pidgeon. With a much more dangerous-looking beak. 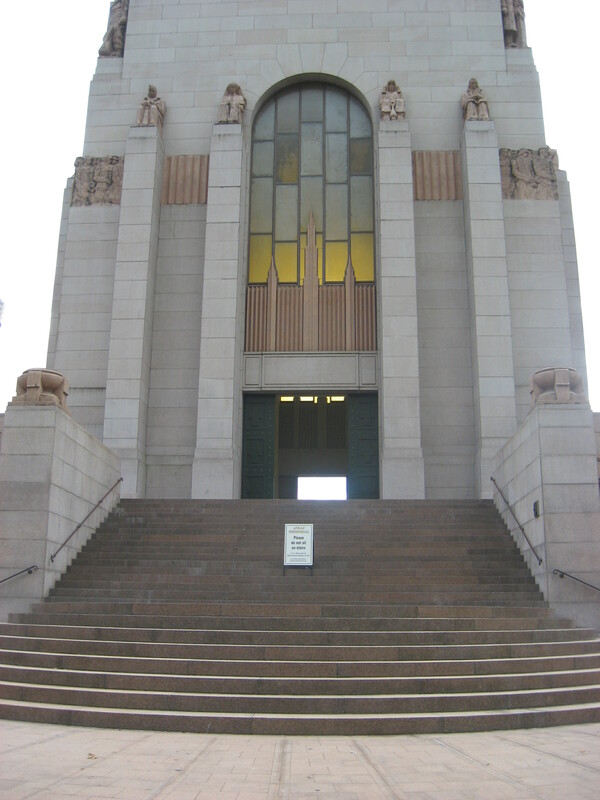 Below is the ANZAC War Memorial, built to honor Australia’s WWI soldiers. Sydney’s Sky Tower. We had tickets to get up there on a tour, but ran out of time. Sometime in the early afternoon, Graham discovered he was not perfectly fine after all — in fact, he was asleep on his feet — and we headed back to the hotel. We took the rest of the afternoon easy and had a quiet dinner in the restaurant above the pub across the street. Next up: Day 3, which we spent on a wine tour with van full of oenophobes.